Let me admit up front that I'm a sucker for free food. And I'll join practically any club (within reason) that offers me this. So when I heard about the "Friends of Krispy Kreme" club that sends you a free Donut Sundae voucher for your birthday if you join up, I'm busily typing in my details before I can finish reading. I must warn those who are hoping for a fast freebie (myself included in this hungry group), that I was actually signed up to their newsletter for over a year and one birthday passed by without any card so these birthday cards are not guaranteed and my husband has yet to receive one but I will say that you when you get one just before your birthday, you feel rather special. 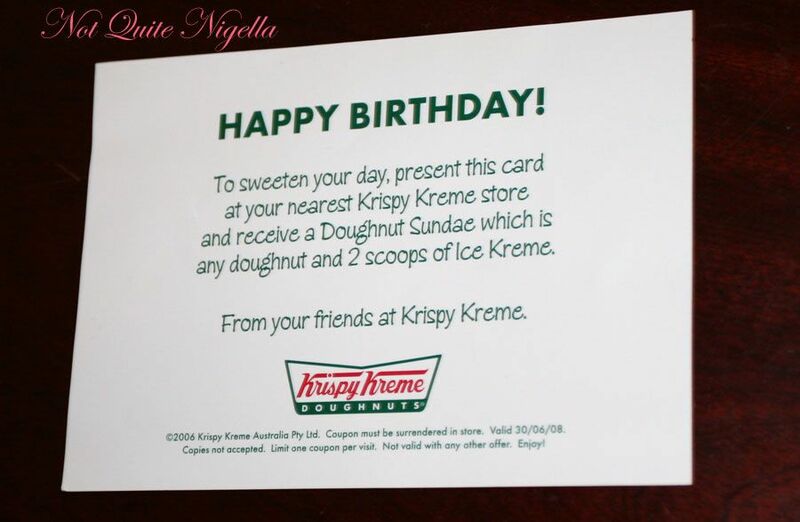 Its quite a few months past my birthday when I go to redeem it. 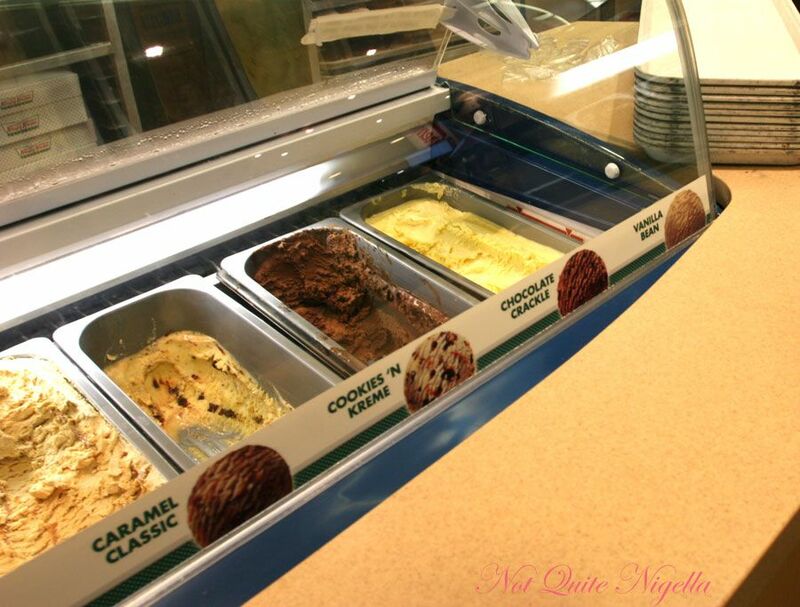 Since my birthday is in Autumn, I don't really have much of a craving for ice cream until the weather gets warmer. So on a warmish evening after a movie I find myself happily clutching my free Donut Sundae card and praying silently that they don't sing "Happy Birthday" to me like I've heard some KK staffers subject the voucher holders to. 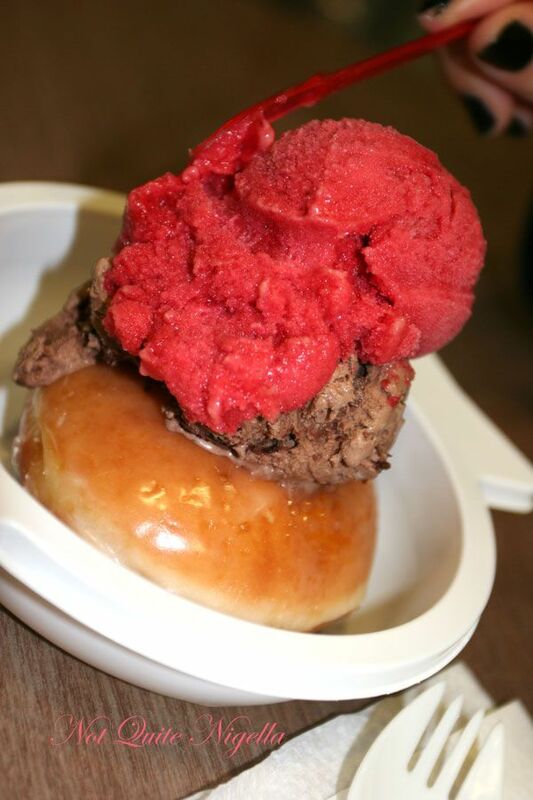 I'm entitled to a free donut sundae with 2 scoops (normally $5.95) and I settle on the Raspberry and Strawberry sorbet and the Chocolate Crackle ice cream on a Lemoncrats donut. Not due to any political affiliation mind you, I just love lemon curd! 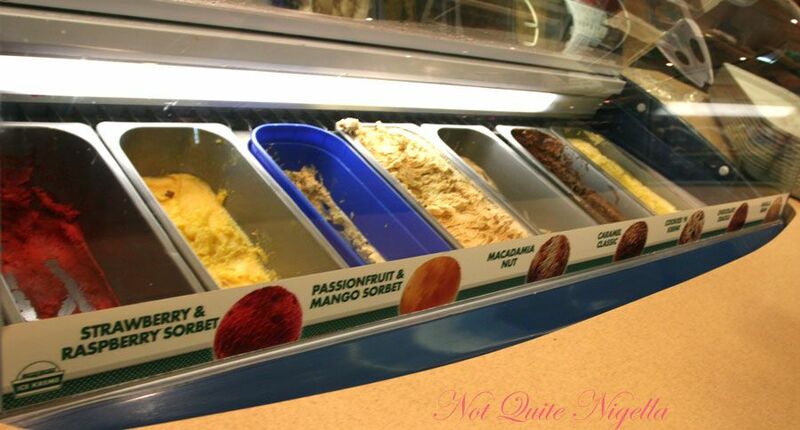 The other ice cream flavours on offer are: Passionfruit & Mango sorbet, Macadamia Nut, Caramel Classic, Cookies and Creme and Vanilla Bean. We take our winged bowl to the table and dig in eagerly. The strawberry and raspberry sorbet is redolent of real berries and vividly hued. Its very sweet and perhaps a little to sweet for those who like their sorbet to be more frozen fruit-like but good for those who prefer their sorbet on the sweet side. The chocolate crackle comes with enormous chunks of milk chocolate and is the definite favourite of the two. They're not sparing with the chocolate chunks at all, in fact I've never come across so many chunks except possibly when I make ice cream. 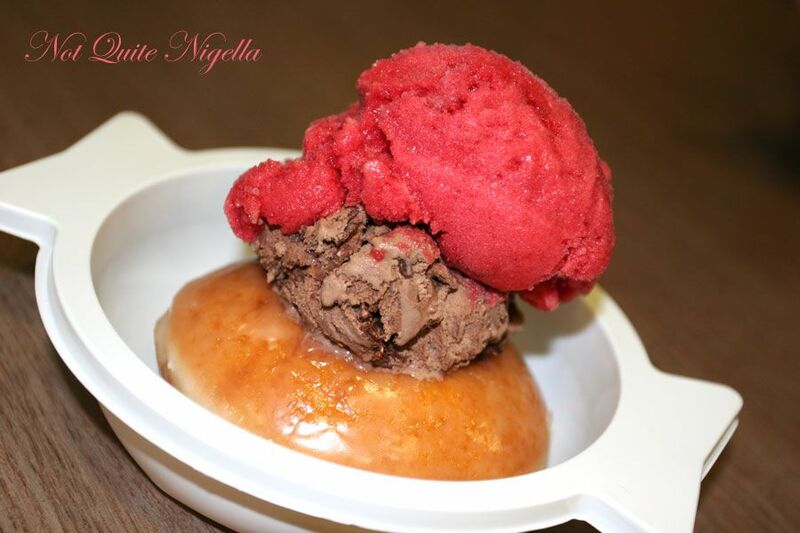 What's most surprising is that the donut is the good pairing for the ice cream. I initially thought "Ugh, that sounds terrible together, I'll eat them separately" but actually it works. Even my husband who doesn't really like KK donuts that much is eagerly digging into the donut and making himself a icy covered donut confection. When I declare that I've had enough he without hesitation finishes the rest, lemon curd centre and all. 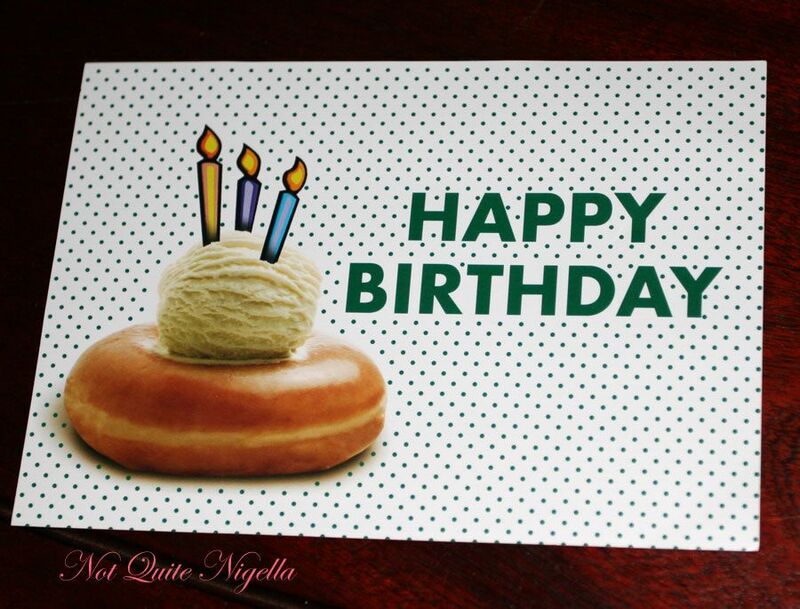 If you can't wait until your birthday and can ward off your sugar pangs until Sunday November the 25th when all of that political nonsense is over, they're also giving out a free half dozen original glazed donuts (with a voluntary donation of a gold coin). See here.